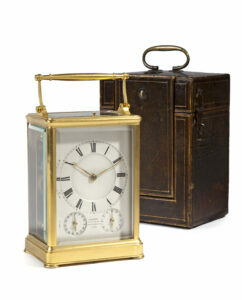 The day-going, spring-driven movement has going, striking and alarm trains. 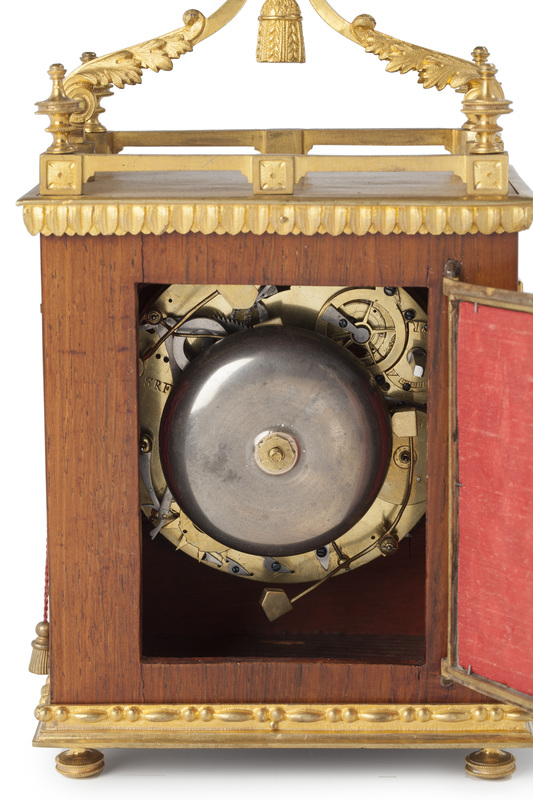 The going train of this officer’s clock has Debaufre escapement with balance, hairspring and regulation. Every quarter hour the grande sonnerie striking indicates the hours on a single bell followed by the quarter-hours on two bells differing in pitch. In addition the hour last struck can be repeated at all times by pulling a chord (trip repeat). 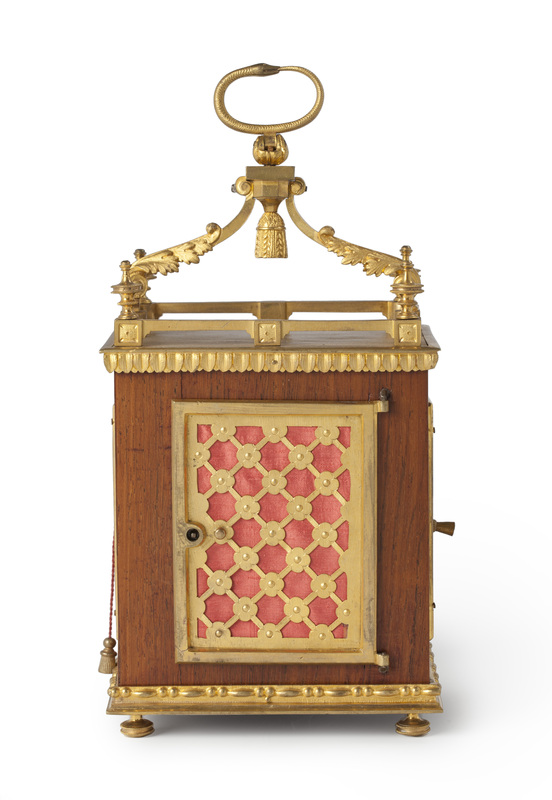 The alarm is activated by pulling another chord winding a small spring. 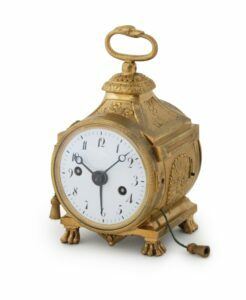 The alarm time is set by a central sweep blued-steel pointer on the chapter ring. There is a lever under the dial to switch off the alarm. The white enamelled dial has a Roman chapter ring, with Arabic five-minute and minute divisions. 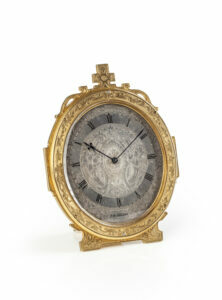 The time is indicated by a fine pair of pierced and engraved firegilt-brass hands. The dial is protected by a convex glass set in an engine-turned gilt-brass bezel. The maker has signed the clock above the middle of the dial: Sl Roi et Fils Chaux de Fonds. 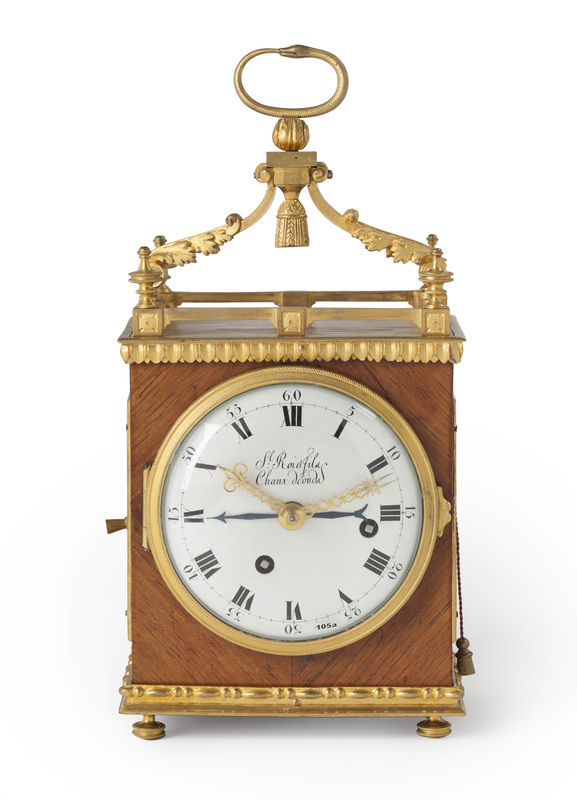 The rosewood case of the officer’s clock is embellished by gilt-brass mounts. 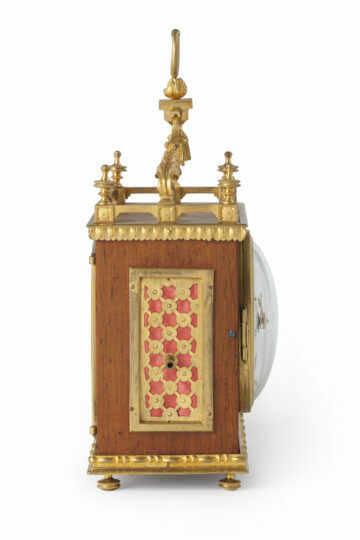 The top of the clock has gilt-brass railings all around, with engine-turned finials on the corners. It is surmounted by a carrying handle in the shape of a snake eating its own tail (ouroboro), a symbol for eternity. There are rectangular silk-backed trellis sound frets to the sides. The clock rests on four claw feet. A. Chapuis, Histoire de la Pendulerie Neuchateloise, Paris, 1983, p. 485. Samuel Roi et Fils were active in La Chaux-de-Fonds around 1780.